A free ticketed event, see the Cooper Gallery Website for details. Tickets for this event are live on Thursday, January 17th at 10:00 am! Join us for a special tour of the Cooper Gallery's current exhibition, Nine Moments for Now, led by the exhibition curator, Dell Marie Hamilton! 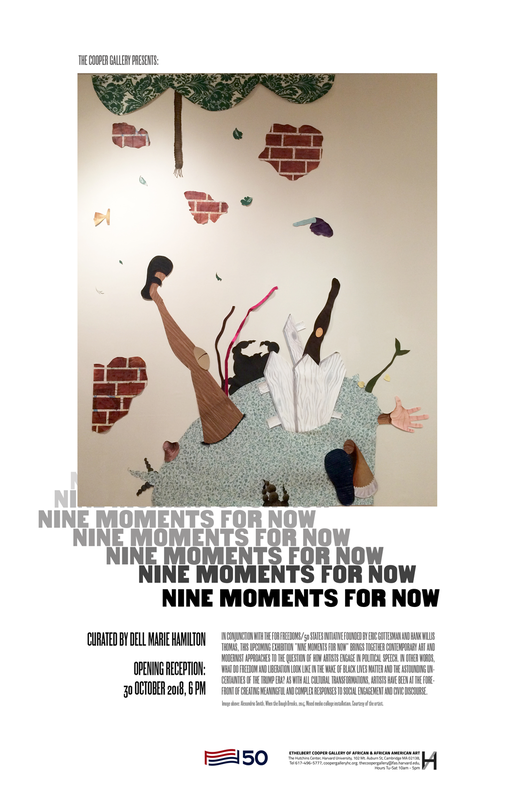 Nine Moments for Now is a part of the For Freedoms nationwide initiative, spearheaded by artist Hank Willis Thomas. Tickets for both dates of this tour will go live at 10 am, Monday, December 3rd. Join us for our opening reception! Introducing our Cinema Series for ReSignifications! Carefully curated to supplement our current exhibition, these stellar films from around the world will be screened Fridays at noon through the month of April. 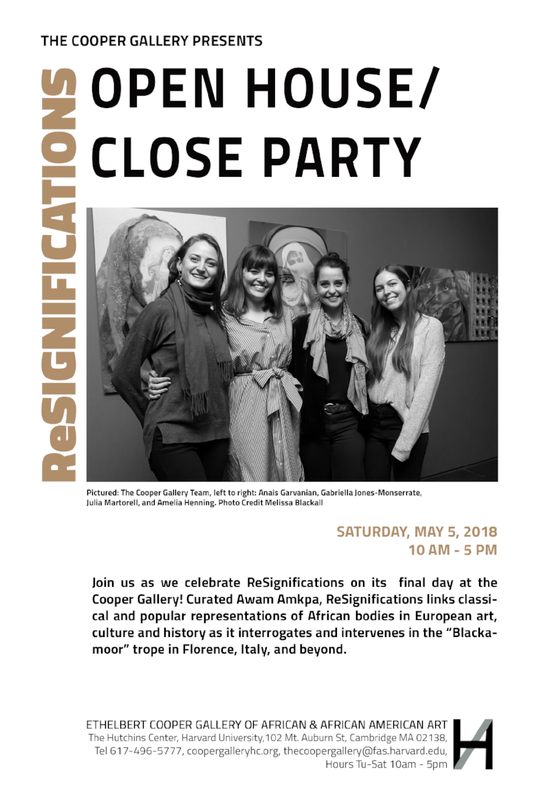 Join us as we celebrate ReSignifications on its final day at the Cooper Gallery! Curated Awam Amkpa, ReSignifications links classical and popular representations of African bodies in European art, culture and history as it interrogates and intervenes in the “Blackamoor” trope in Florence, Italy, and beyond. 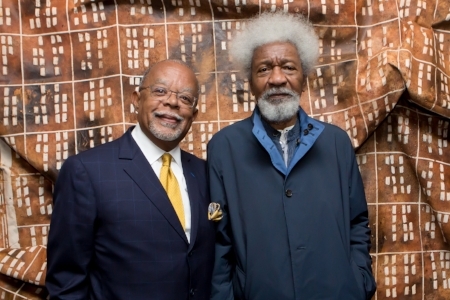 Join us for a special Director's Tour of Wole Soyinka: Antiquities Across Times and Place. The tour will be led by Director of the Cooper Gallery, Vera Ingrid Grant. Read more about Vera here. 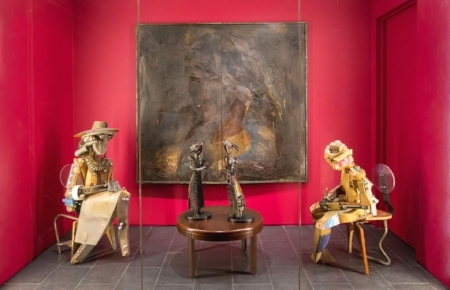 Join us for yet another Curator's Tour of WOLE SOYINKA: Antiquities Across Times and Place. 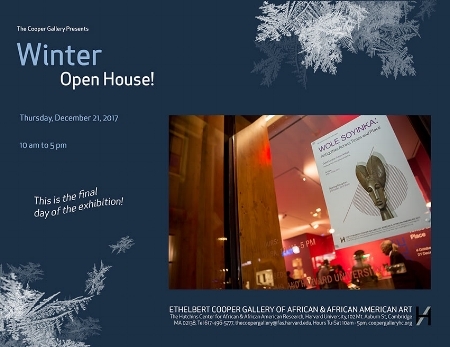 Awam Amkpa, Professor at NYU Tisch School of the Arts, will provide a special tour of the current exhibition at the Cooper Gallery of African & African American Art. Awam is offering one tour in November and another in December. Free and open to the public! Registration required. 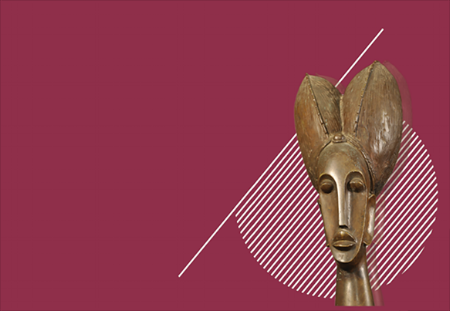 Join us for a special tour of the Cooper Gallery's Fall 2017 exhibition, Wole Soyinka: Antiquities Across Times and Place. This tour will be led by the curator of the exhibition, Awam Amkpa, NYU Tisch School of the Arts Associate Professor. Read more about Awam Amkpa here.